Villa Bianca is an exclusive and luxury furnished 4 bedroom villa with private swimming pool, set in beautiful grounds in group of five villas. 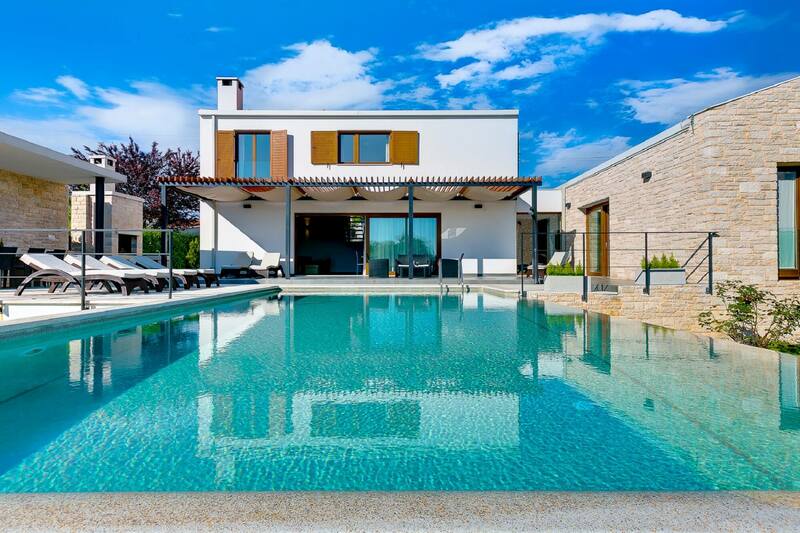 This beautiful, in mediterranean style built villa is situated in a quiet and relaxing area in central Istria, but just a short drive away from tourists centers Poreč and Rovinj with their beaches. With its modern and contempory furnishing Villa Bianca provides all luxury you can imagine. Large, panoramic windows overlook the garden and the pool fill the villa with light. The lower level, consists of modern fully equiped designer kitchen and the gorgeous open plan lounge with fire place and dining area, SAT TV, DVD player, microwave, fridge, freezer, coffe machine, dish washer, washer, iron and board and a childs high chair. There is also one bedroom with double bed and en-suite bathroom and it has an exit to the terrace. Free WI-FI is available for you to use during your stay. From the modern and spacious lounge area you may access the tastefully furnished terraces and to the pool garden with stone built BBQ. Whether you prefer to relax and dream in privacy, dine al fresco with your family or entertain guests in style, there are no limitations in enjoying the exceptional outdoor entertainment areas. On the upper level is one walk-through bedroom with 1 double bed and en-suite bathroom, one bedroom with one single bed and one bedroom with two single beds end en-suite bathroom. This villa is truely the perfect place to relax and forget the stressful days.